It’s embarrassing to be a gardener this week, when the lotus are in full bloom in the Mobile-Tensaw Delta. You could hire the world’s finest garden designer, you could spend months preparing your garden, you could buy thousands of plants, and you’d never produce anything like this. I’m not at all exaggerating when I tell you there are miles of lotus in bloom, fragrant, wind-tossed, flowers bobbing in waves, leaves twirling like a parade of green parasols, great swaths of them lining the banks of the Tensaw, Blakeley and Apalachee rivers, extending into the Delta’s seemingly endless labyrinth of bayous, basins and dead lakes. Lotus blooming along the Blakeley River in the Mobile-Tensaw Delta. Photograph courtesy of Bill Finch. Next week, or the next, they may be blooming in large patches up the Tombigbee near Leroy and Jackson. A few more weeks, and they’ll at last open in the small patches left on the Tennessee River, near Huntsville and Scottsboro. They’re beautiful in all these places. But I think they’re sacred here in the Mobile-Tensaw Delta, or should be. There are only a few species of lotus in the world. In Asia, the pink or red lotus has become a symbol of life, religion, culture. In the Americas, our native lotus is a bright golden yellow, and it was once apparently confined to subtropical rivers, from South and Central America along the Gulf Coast to Florida. But early Americans were so enthralled with the plant, they tried to take it with them wherever they went, and it was apparently introduced to the upper Mississippi, Tennessee and Ohio river systems. It’s no wonder. It’s not only beautiful on a grand scale, it’s also an important food stuff. Its roots and its stems are delicious and nutritious – they’re considered delicacies in Chinese and Vietnamese cooking. The nuts produced by the native yellow lotus were the real prize in North American. When the seeds start to rattle in the pod, they nuts are sprinkled out, the husk and dried green germ are removed, and used raw, roasted, in cakes savory and sweet, and in medicines. The lotus leaf is almost as ornate as the flower. Photograph courtesy of Bill Finch. Anything that beautiful and that useful is surely something you’d like to have in your own yard. But even though I’m the garden guy, my advice in this case is useless. Yes. I have a few lotus in my yard, fitful hybrids from here and there growing in small ponds and water jars. Some years they can be quite a sight in the small little way of gardens. Get them in the right mood, and they’ll shame any rose, azalea or magnolia in your yard. I highly recommend them. But I don’t have a clue how you produce a Delta-scale spectacle in your yard. The display you’re seeing in the Delta right now requires the effort of nearly all the rivers and streams of Alabama, converging on this little corner of southwest Alabama, breaking into hundreds of smaller streams and lakes and basins as it splashes into the waters of the Gulf of Mexico between the high bluffs of Mobile and Baldwin counties. Lotus grow well only in deep mud, in standing water. 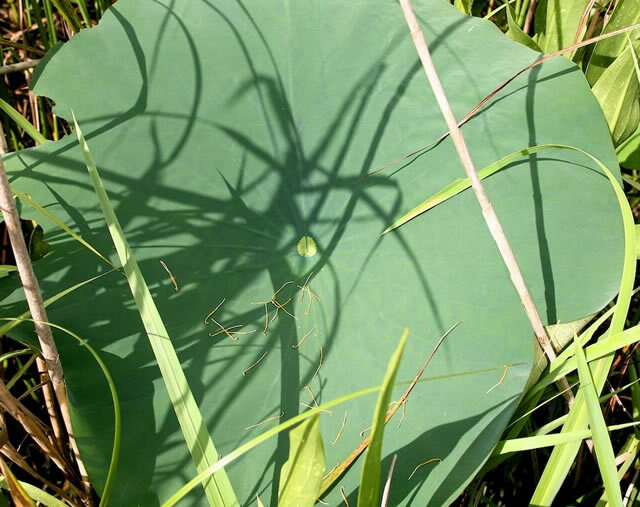 Few other plants can survive those conditions, and that’s one of the reasons lotus prosper in the shallow waters of the Delta – they don’t have much competition. But lotus also need relatively stable water. They can’t tolerate long periods of high water, which would smother the leaves and keep the plants from growing. 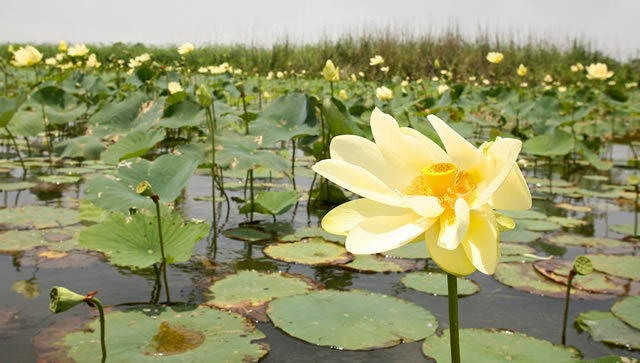 That’s why the great expanse of the Delta – which can swallow a major flood while rising only a few inches — produces one of the biggest natural shows of lotus anywhere. And that’s why the damming of the Tennessee River – which has frozen the natural rise and fall of that river system –created an unnatural explosion of lotus in recent years. In the shallow backwaters of the dam – areas that use to be occupied by bottomland forest, farmland and even towns and villages – the lotus spread with a vengeance. It’s as if the lotus was trying to restore some semblance of beauty and life to the submerged lands. This proves irritating to some, and every year one group or another threatens to herbicide the whole mass of them. A couple of years ago, I’m told, they finally got enough money together to herbicide on a large scale. Some familiar with the river say they lost not only the lotus, but the great flocks of herons and redwing blackbirds that used to congregate there. In its place, Asian and European invasives like Eurasian water milfoil have taken hold. 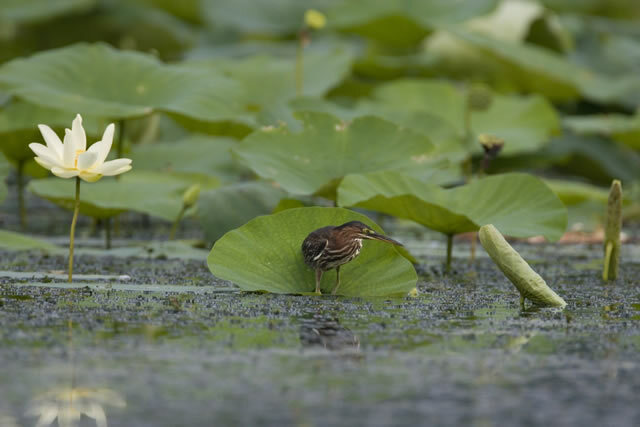 A young little green heron stalks the lotus along the Tennessee River, in the days before the lotus were knocked back by herbicides. Photograph courtesy of Beth Maynor Young. There’s a lot of confused yammering about what’s native and what’s not, what should be allowed and what shouldn’t be on the large, artificial lakes of the Tennessee. But it’s amusing to recognize that those who complain about lotus the most are often the very ones most responsible for its proliferation. After all, the only way to finally reduce the lotus population on the Tennessee is to restore the river’s natural rhythm of rise and fall. In the Mobile-Tensaw Delta, we don’t have to twist ourselves into such moral contortions when we enjoy the lotus. We just have to become humble gardeners, recognizing that as long as we keep the delta and its surroundings healthy and vibrant, this sacred display of flowers and food is as old and persistent as the great Alabama river system that created it.